Even though he’s distracting himself with a comic about nuns with guns, Kurt Sutter remains a one-percenter at heart. 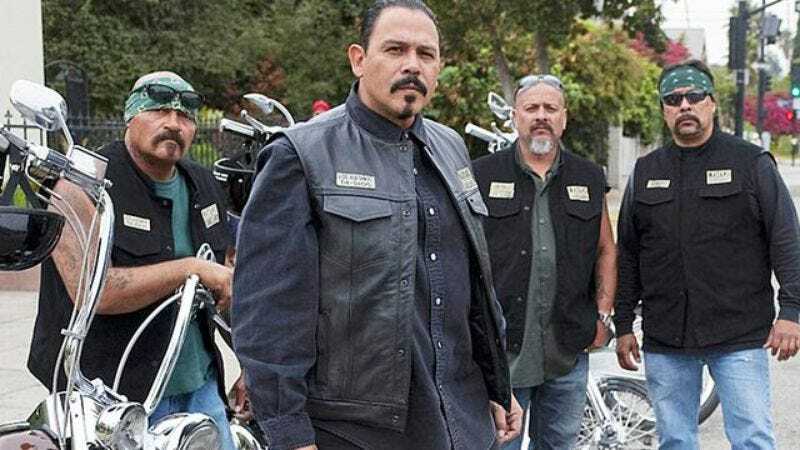 According to a press release from FX, Sutter has co-written the pilot for his Sons Of Anarchy spin-off Mayans MC, which will begin shooting in March 2017. The series creator tag-teamed the script with Elgin James, but Sutter will direct the episode while James produces. We already know that this new addition to Sutter’s outlaw franchise will focus on the Mayans, who are based out of northern California, with toeholds in Las Vegas. Now FX has revealed that the name and motivations of the protagonist. The action will center on EZ Reyes—which is maybe a spoonerism of Easy Rider?—a new Mayan prospect situated at the California-Mexico border. He’s seeking vengeance against s whole cartel, so joining a gang is probably a good idea. Lest you think he won’t reach Jax Teller levels of navel gazing, EZ will also struggle with his “need for respect from the women he loves.” The plural there makes us wonder if Katey Sagal will learn Spanish so she can be a part of this motorcycle family, too.